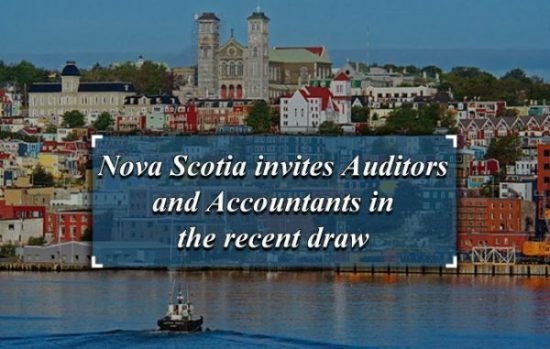 The Government of Nova Scotia conducts the first round of invitation of 2019, issuing invitations to Express Entry candidates having work experience as financial auditors or accountants. The invitations to apply (ITAs) were issued on January 24th through the Labour Market Priorities Stream launched last year. These invitations are further utilized for a nomination for permanent residence. Through the Labour Market Priorities Stream, Nova Scotia’s Office of Immigration is able to search eligible candidates from the federal Express Entry pool with work experience in specified occupations. Express Entry candidates were required to have at least five years of work experience in the National Occupational Classification (NOC) 1111 — Financial Auditors and Accountants. Those Express Entry candidates were selected who had submitted their profiles on or after July 1, 2018, and they had an Express Entry ranking score in the range from 400 and 450, among other criteria. The most recent Federal Express Entry draw only invited candidates with scores of 443 or above, whereas Nova Scotia invited candidates with scores as low as 400. The provincial nominee streams can help Express Entry candidates with lower scores to achieve their goal of permanent residence. Express Entry candidates with a low ranking score, usually below the cut-off in recent Express Entry draws can manage to get selected through this route. With a provincial nomination, Express Entry candidates are provided an additional 600 points towards their Express Entry ranking score, effectively assuring an invitation to apply for Canadian permanent residence in a subsequent Express Entry invitation round. • a bachelor’s degree OR have completed a program of three or more years at a university, college, trade or technical school, or another institute. • a Canadian Language Benchmark score of 7 or higher in English or French for speaking, listening, reading and writing. • letters of reference from employers to demonstrate proof of a minimum of 5 years of work experience in NOC 1111. Also subscribe our Yotube channel for frequent updates.